As we have seen in Part Two, the center and the borders of the self are perpetually shifting and in a person’s ordinary waking consciousness, our sense of who we are can include not only our body, mind, and personality, but even possessions, other people, roles, group-memberships and whatever else we happen to identify with at a given moment. What we consider our self and where we locate our borders, can vary over a stunningly vast range. To make things more complicated, we tend to have, simultaneously, different identities on different levels. There is a deep identity that hardly changes — if at all: you are, at least in some strange way, the same person that you were when you were one year old, or even younger. There are other identities which change slowly, over long periods, like those related to your work, social position, close family, health, country, faith. And finally, there is a surface identity which cheerfully flips from one state to another in a fraction of a second, as when you are engrossed in a book, and a sudden sound or physical touch makes the center of your identity jump almost instantaneously from some imaginary reality in the mind towards the body. Both the average and the ideal location for the borders of the self differ not only between individuals but also between different knowledge systems and (sub)cultures. In the next section we'll have a look at four quite different ways of understanding the self. The table in this section intends to give a quick, schematic overview of four different ways of conceptualising the self. The horizontal axis of this table is based on a concentric view of our subjective reality: On the left is our deepest, innermost essence. It is the secret uppercase Self all spiritual traditions urge us to discover. On the right is our outermost physical environment. Our felt self, what we feel we actually, subjectively are, hovers somewhere in between. Vertically we have four typical ways of thinking about the self. The first is that of mainstream, academic psychology. The second is the largely implicit, home-grown folk psychology that ordinary people live by. The third is the ideal put forward by what we have called "exclusive spirituality". The last is the integral psychology presented in this book. Mainstream American psychology is based on a worldview that takes the physical world as the primary reality. It assumes that all mental activities have a physical origin in our biochemistry and nervous system, and so it considers character, personality, traits and dispositions to be part of ourselves, while work, relationships, group-membership, other people and possessions etc are seen as belonging to the "outside" world. It has no place for the soul or for pure consciousness.1 In short, its concept of the individual is strongly "skin-encapsulated". Most folk psychologies don't have much to say about pure consciousness either, but most people, even in Europe and the USA believe in the soul and life after death, though what exactly this means will differ from region to region[REF]. Where folk psychologies in India differ from those in Europe and America is regarding one's immediate social "group". In India, the concept of family, for example, includes more distant relatives and is more hierarchically structured than the concept of family in Europe and the USA. A spiritual and religious sense of reality also appears to be more widespread. Still, the differences are not that large and as a whole one could say that in all folk-psychologies the borders of the self tend to extend further towards the spiritual and further towards the social. In the philosophical and spiritual traditions of India, the situation is again quite different. Here the essential identity of the individual tends to be seen as a centre of pure consciousness, and not as an egoic, social or physical organism at all. In other words, most spiritual traditions in India place the ideal borders of the self radically further inside, so much so, that the centre of identification becomes one with the Transcendent or, as in some forms of Buddhism, disappears altogether. In Table a2-3, we have distinguished two types of Indian spirituality, one exclusive, one integral. The exclusive schools all advocate realisation of the Transcendent as the ultimate goal, but they differ in how they look at the individual soul and the manifest world. The mayavadin interpretation of Advaita Vedanta considers both individual differences and the manifest world as illusions created by ignorance. Samkhya accepts the manifest world not only as real, but even as eternal, but considers it inferior to the Transcendent. In Buddhism the manifest world is considered real but characterised by suffering and in most Theravadin and some Mahayana schools, the individualised self is seen as lacking substance. In spite of their differences in all these schools, release into a Transcendent nirvana is seen as our ultimate destiny. In the table, we have indicated the Transcendent with "That" (as the English translation of the Sanskrit tat) and everything else, being either unreal or irrelevant, with " - " . We'll now have a look at how this leads to different meanings for the words inner and outer. What is inside, what outside? What inner, what outer? What we consider inner and outer depends on our vantage point and our interests. As long as I don't get involved in psychology and philosophy, life is simple. When I look at a person, inside means inside that person and outside means belonging to that person's environment. So, when I say for example, "his ideas come from inside", I mean that he has thought them out himself, and when I say "his ideas come from outside", I mean that he may have got them from his friends or social media. As soon as different kinds of psychology get involved, the situation becomes quickly more complex. 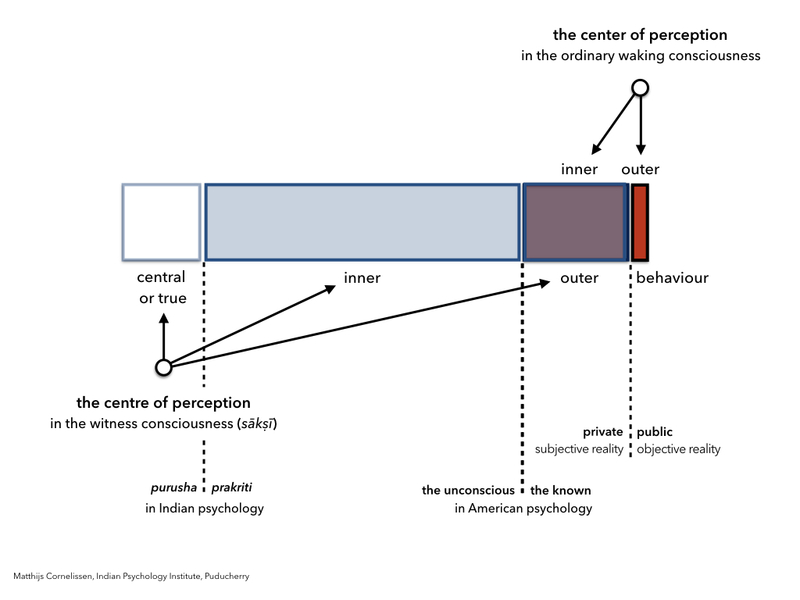 Figure a2-3 shows what happens when we consider the perspective of mainstream psychology as based on the ordinary waking consciousness, and the perspective of integral psychology as based on the puruṣa-centered witness consciousness. Our outer nature consists only of our objectively observable behaviour4. Whatever else is known in the ordinary waking consciousness (which is very little) is called inner. In its terminology, the outer nature contains all the feelings, thoughts, volitions and sensations that people are aware of in their ordinary waking consciousness. The term inner nature is now used only for those feelings, thoughts, volitions and sensations that people in their ordinary waking consciousness are normally not aware of. This (much larger) part of our nature is also called the subliminal, and occasionally the subconscient, though this latter term is also used more specifically for the lowest and darkest corner of the subliminal nature which Freud called the unconscient. All these terms are described in more detail in the second chapter of Part Two of Infinity in a Drop. How to study the inner and outer? What mainstream psychology calls outer belongs to the "realm of objective knowledge". What mainstream psychology calls inner belongs to the "realm of subjective knowledge". What integral psychology calls inner belongs to the "realm of inner knowledge". The innermost region containing the Soul and the Self belongs to the "realm of knowledge by identity". 1. One of the most popular dictionaries of philosophy has no entry for consciousness, and there is a multi-volume encyclopedia of psychology that has no entry for "soul". Clearly these are not casual oversights, but a deliberate declaration of a philosophical position if not an ideology. 2. One could say that as long as one identifies with a small and fragile biological creature in a big and threatening world one has to defend oneself, so one has to build solid walls around oneself. But if one identifies with one's eternal and immutable Self, there is no longer anything that needs to be defended or excluded. 3. The reason there is suffering and imperfection in this otherwise(?) incredibly beautiful and well-made world, is that we have to develop into centers of conscious action that not only act in full harmony with the whole, but that are also as entirely free as the Divine is. To make such free yet perfect action possible, every last little crumb of our nature must be perfectly aligned with the whole of the manifest reality. This takes time and labour. More on this in the chapter on self-development [INTERNAL LINK]. 4. In the Appendix there is a short chapter on classical behaviourism and another one about the epistemological differences between the main schools of psychology.